Another East Side establishment will be closing its doors for good this weekend. After nine years in business, The Black Rose Irish Pub‘s official last day of business will be tomorrow, May 26. A closing party took place last night. We will be selling our building and closing down the Black Rose next Saturday night. Our official closing party will be held on Thursday May 24th with $3 Skyy Bombs and our last day of operation will be Saturday May 26th. Thanks for all the years of support and we hope to see you for a few more beers, cocktails and memories! 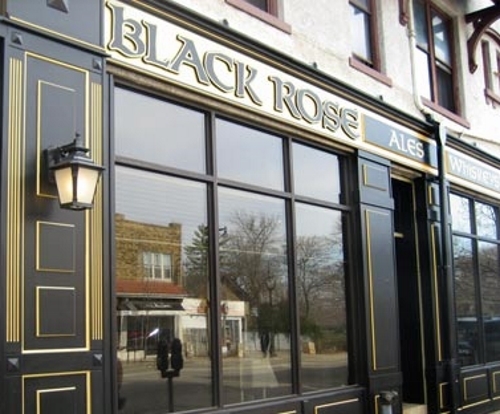 The Black Rose has been serving Irish and Gaelic food and drink since 2009, overseeing the coming and going of multiple businesses in the shared space at 2856 N. Oakland Ave. The connecting area formerly housed a number of businesses throughout the years, including Oakland Trattoria, SoLo Pizza and most recently, Monster Pizza MKE. All of these businesses have one thing in common: their proprietor, Robert C. Schmidt. The pub is the third business operated by Schmidt to close in the past five months. Black Rose’s neighbor, Monster Pizza MKE, closed in December, while the long-running East Side bar, RC’s, closed just last month. RC’s, Schmidt’s namesake, closed in April after 44 years in business. While some were rocked by the closure, the bar’s sporadic openings and closings in the months prior to its demise was a tipoff its end was coming. OnMilwaukee reported that Schmidt would not name the buyer of the RC’s building, and it is unknown if the same buyer has purchased the Black Rose. Attempts to contact Schmidt by phone were unsuccessful, as were attempts to contact the company online. A changing and younger demographic on the East Side probably contributed to RC’s demise. Closing the bar in an area increasingly populated by underage students allows Schmidt to focus on other businesses, such as Water Street Brewery, Trinity Three Irish Pubs, The Harp, Vagabond and Louise’s. Within walking distance of UW-Milwaukee, Black Rose’s location, on Oakland and Locust, is surrounded by student-filled houses and apartments. The young population in the neighborhood may be as responsible for the Black Rose’s death as it was for RC’s.